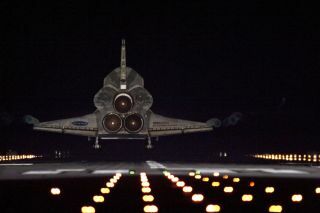 Runway lights help lead space shuttle Endeavour, seen here from behind, home to NASA's Kennedy Space Center in Florida. Endeavour landed for the final time on the Shuttle Landing Facility's Runway 15, on June 1, 2011, marking the 24th night landing of NASA's Space Shuttle Program. Candidates for the 2012 Republican presidential nomination tackled the future of NASA, without its space shuttle program, among other issues during the GOP's first debate, in New Hampshire Monday night (June 13). The question on NASA's future came from reporter Jean Mackin of news station WMUY in Hancock, N.H.: "What role should the government play in future space exploration?" Mackin directed the question at former House Speaker Newt Gingrich, noting that NASA is ending its 30-year space shuttle program next month and will pay Russia's space program $63 million per seat to fly American astronauts on Soyuz spacecraft for trips to the International Space Station until commercial U.S. spacecraft become available. The last shuttle to fly will be Atlantis, which is set to launch July 8. Well, sadly — and I say this sadly, because I'm a big fan of going into space and I actually worked to get the shuttle program to survive at one point — NASA has become an absolute case study in why bureaucracy can't innovate. If you take all the money we've spent at NASA since we landed on the moon and you had applied that money for incentives to the private sector, we would today probably have a permanent station on the moon, three or four permanent stations in space, a new generation of lift vehicles. And instead what we've had is bureaucracy after bureaucracy after bureaucracy, and failure after failure. You know, you'd asked earlier, John, about this idea of limits because we're a developed country. We're not a developed country. The scientific future is going to open up, and we're at the beginning of a whole new cycle of extraordinary opportunities. And, unfortunately, NASA is standing in the way of it, when NASA ought to be getting out of the way and encouraging the private sector. John, you mischaracterized me, I didn't say "end the space program." We built the transcontinental railroads without a national department of railroads. I said you could get into space faster, better, more effectively, more creatively if you decentralized it, got it out of Washington, and cut out the bureaucracy. It's not about getting rid of the space program; it's about getting to a real space program that works. I think the space program has played a vital role for the United States of America. I think fundamentally there are some people — and most of them are Democrats, but not all — who really believe that the government knows how to do things better than the private sector ... And they happen to be wrong. NASA's final space shuttle flight is scheduled for a 12-day mission to deliver supplies and equipment to the International Space Station. The mission is designated STS-135, representing NASA's 135th space shuttle flight since the fleet began launching into orbit in April 1981. NASA is retiring its shuttle fleet to make way for a new space exploration program aimed at sending humans to an asteroid by 2020 and to Mars in the 2030s. The space agency is developing a new Multi-Purpose Crew Vehicle, based on the Orion space capsule designed under its previous moon-oriented Constellation exploration program, to serve as the core vehicle of those deep-space missions.